One of the best things about having the Christmas holiday season during the summer heat is that after a day or two of serious indulgence you start to yearn for a big cool crunchy salad. I haven’t decided whether this compensates for the lack of snow, but it does make it a bit easier to curb that excess! This salad is great as a side dish or a main meal. I only use bacon in it when it is the main, but it is an optional extra. Place the greens into a large flat bowl. Fry bacon until just crisp and spread over the greens with the onion. Cut pomegranate in half. Pull the outer skin away and gently tease the seeds away from the inside pith. 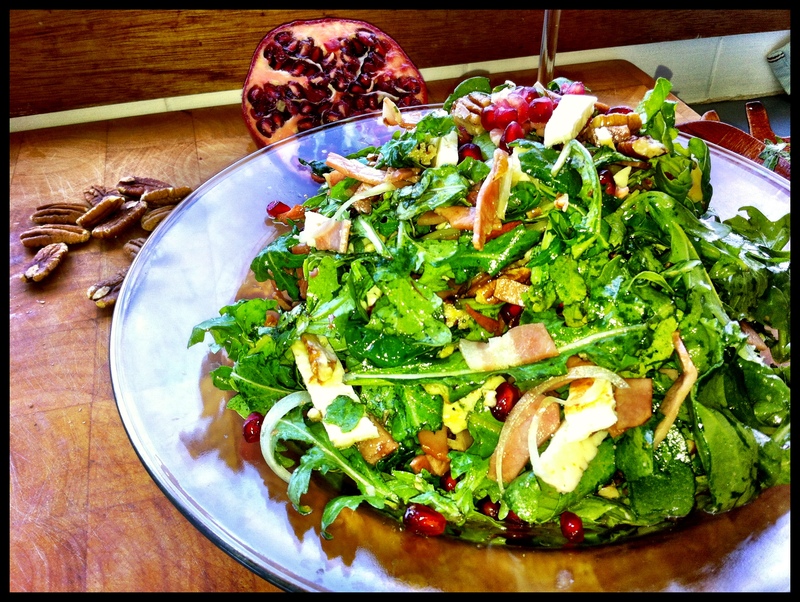 Layer seeds and pecans over the salad, reserving some for garnish. Mix dressing ingredients together and set aside until needed. Once all other ingredients are prepared, it is time to prepare the haloumi. 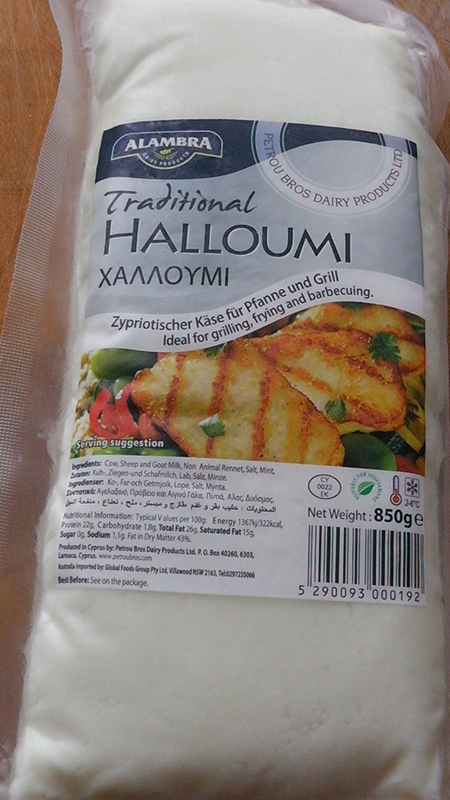 I have found a new brand of haloumi that I love. This is saltier than other brands that I know but it has a lovely flavour and texture. As with any haloumi, you need to serve it as soon as it’s cooked or it will toughen (although if you do find it has toughened up before you are ready to serve, you can zap it quickly in the microwave to soften it up again). Cut the haloumi into 1/2cm thick slices. Fry in dry non-stick frypan on medium high heat until beginning to brown. Flip over and cook until the second side begins to brown. The second side will cook more quickly. Remove from heat immediately and cut into 1cm wide strips. Add to salad. 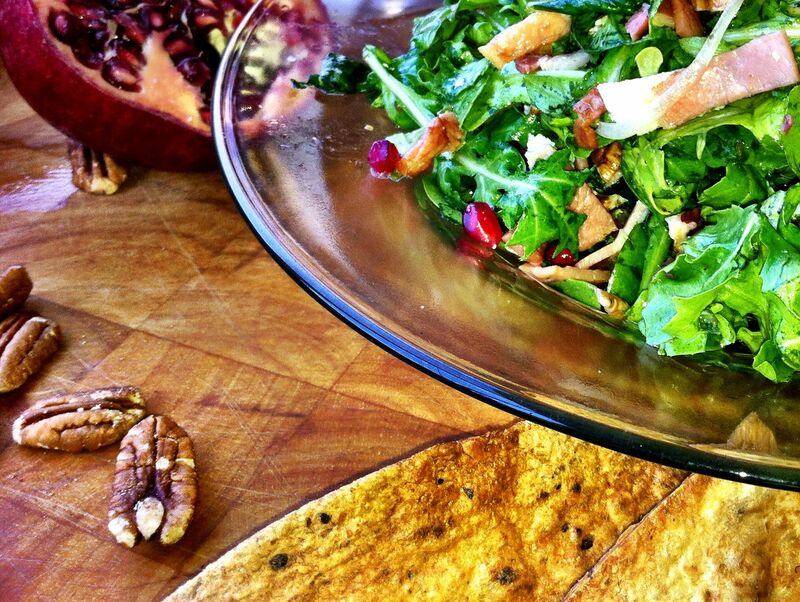 Give the salad a quick toss with just enough dressing to moisten, garnish with pecans and pomegranate, and serve immediately. For a main meal I serve with lebanese bread that has been lightly oiled, sprinkled with herbs and crisped in the oven. Delish! Yesterday was a day for cooking inspiration. 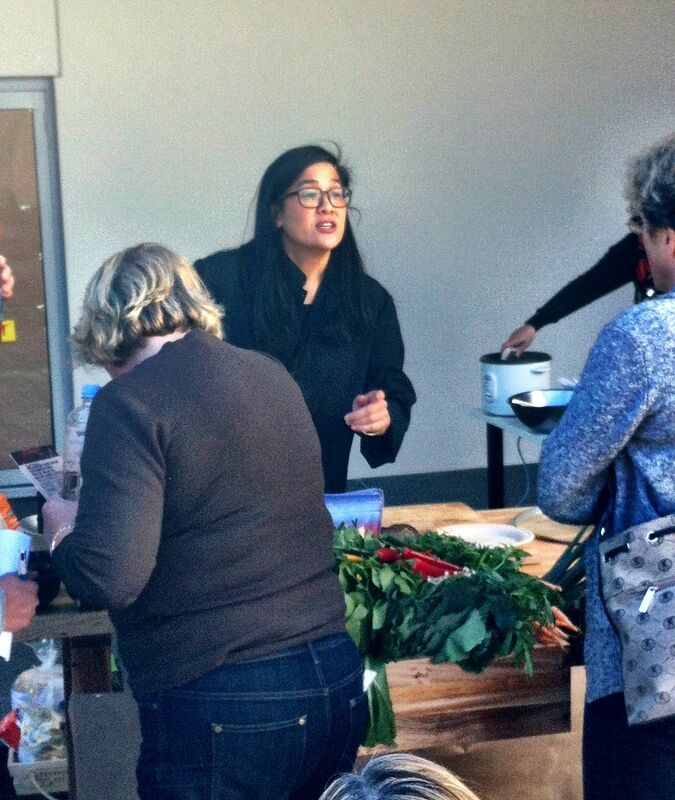 A small group of lucky foodies were treated to a cooking lesson from Kylie Kwong, courtesy of the Harris Farm Market at Boronia Park. 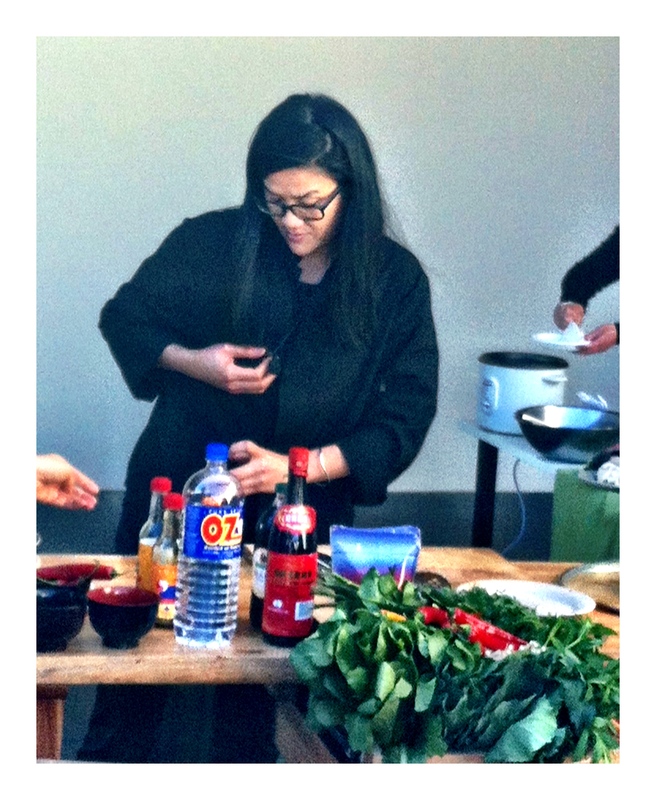 Kylie Kwong is one of Australia’s most successful and most loved chefs. 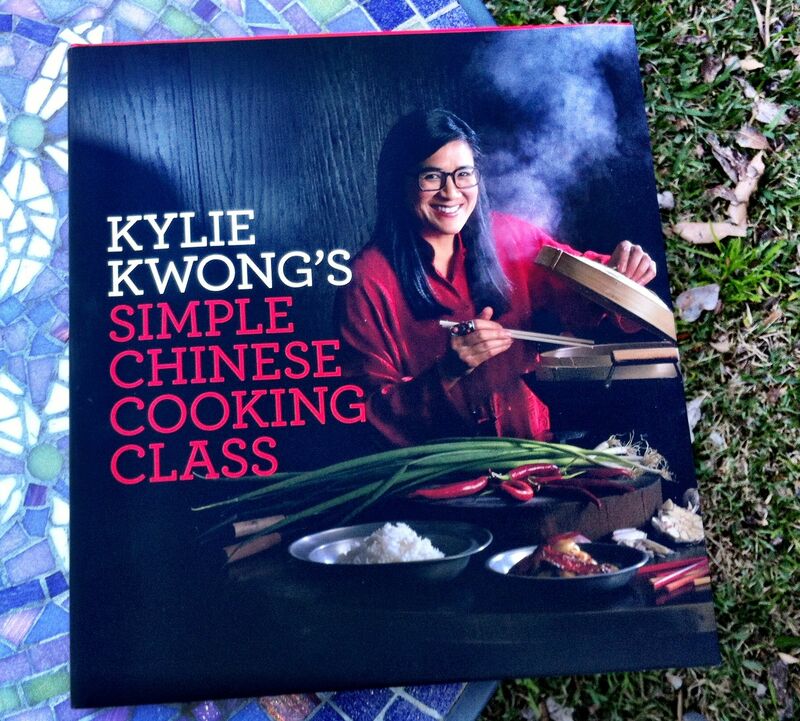 For those not familiar with Kylie Kwong, she has a restaurant called Billy Kwong in Sydney, a cooking show on TV, and many cookbooks to her name. Kylie is of Cantonese heritage, and bases her recipes on traditional Cantonese food, as well as asian twists on foods from elsewhere around the world. As a chef, Kylie is very appealing. Her focus is on fresh quality ingredients, with an emphasis on organic and fair trade products. She is a strong advocate of sustainable food and ethical eating. At Billy Kwong she uses locally grown organic and biodynamic produce. She has been an Australian ambassador for Fair Trade for six years. Kylie does eat meat, but not a great deal. She identifies with a vegetarian diet and has many gorgeous recipes in her repertoire for vegetarians. Her mastery of tofu is amazing! She has a very light touch in her cooking – her food isn’t heavy or gluggy, and it never has that “same dish, different meat” thing that average Chinese restaurants so often offer. She demonstrates how very broad real Chinese cuisine is. Kylie is also very appealing as a person. Her cooking shows are fabulous, partly due to her great food, but also because of who she is. She exudes warmth, and friendliness. She tells many stories about her life and her family. Her mum makes frequent appearances on the show. You just feel good listening to her chat about life in general while she cooks up a storm! 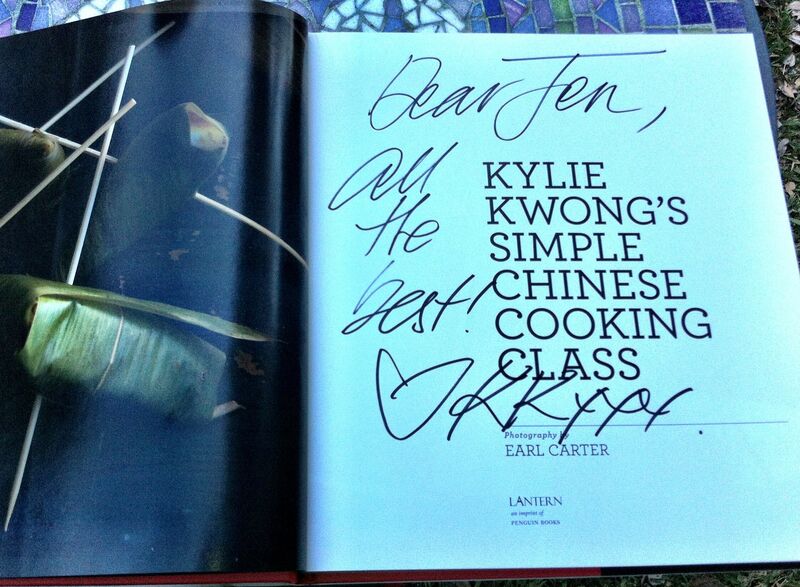 Yesterday was part of a promotional tour for Kylie’s latest cookbook – which of course I HAD to buy (it is gorgeous!). Kylie cooked 4 dishes. As she cooked she talked – about all sorts of things: the benefits of freshness and quality in the ingredients, stories about dishes she has enjoyed in China, the role and importance of family in her life, the passing on of cooking traditions through the generations, and of course, things to think about when cooking each dish. She talked a lot about Chinese food being easy to cook, as long as you focus on the balance between sweet, sour, salt and acidity. She also talked about the importance of tasting as you cook. Clearly a sensitive palate is a big part of knowing when you have a dish just right! Wal wanted a barbecue last night, so I marinated pork chops in sweet soy sauce, sesame oil, garlic, shallots and ginger, and made the salad that Kylie made, The two surprise ingredients for me in this salad were the raw bok choy (I am pretty sure I have only ever seen recipes for it cooked) and tomatoes (which I just never associate with Chinese cuisine). This salad is as delicious and refreshing as it is healthy. Combine all ingredients in a large bowl and mix well. Toss with dressing immediately before serving. Combine soy sauce, brown sugar and lemon juice in a small bowl and whisk until sugar is dissolved. Continue whisking as you slowly drizzle in the oil until it is all incorporated. Add tomatoes and stir to combine. Recipe adapted from Kylie Kwong / Simple Chinese Cooking Class. Sydney : Lantern, 2012. 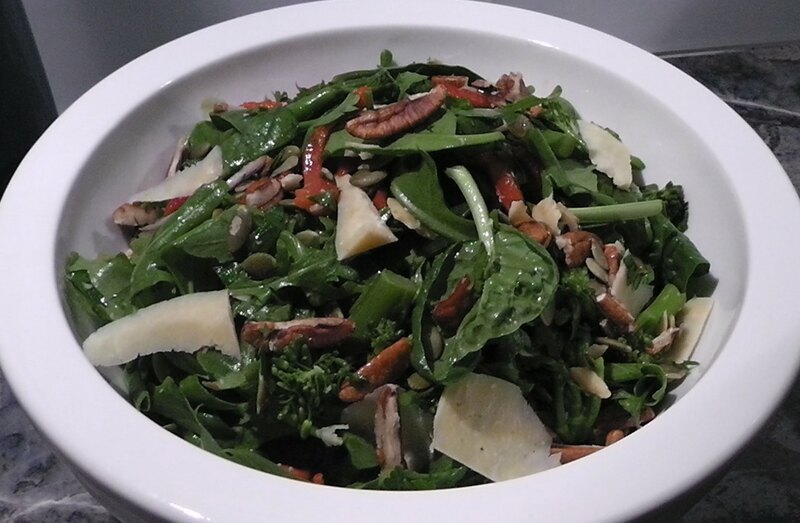 This salad has a lovely combination of both flavour and texture. In summer I would serve this as the main meal with a slice of fresh crusty bread on the side. In winter I use it as a generous sized side dish with some poached or sauteed chicken and toasted sourdough bread. 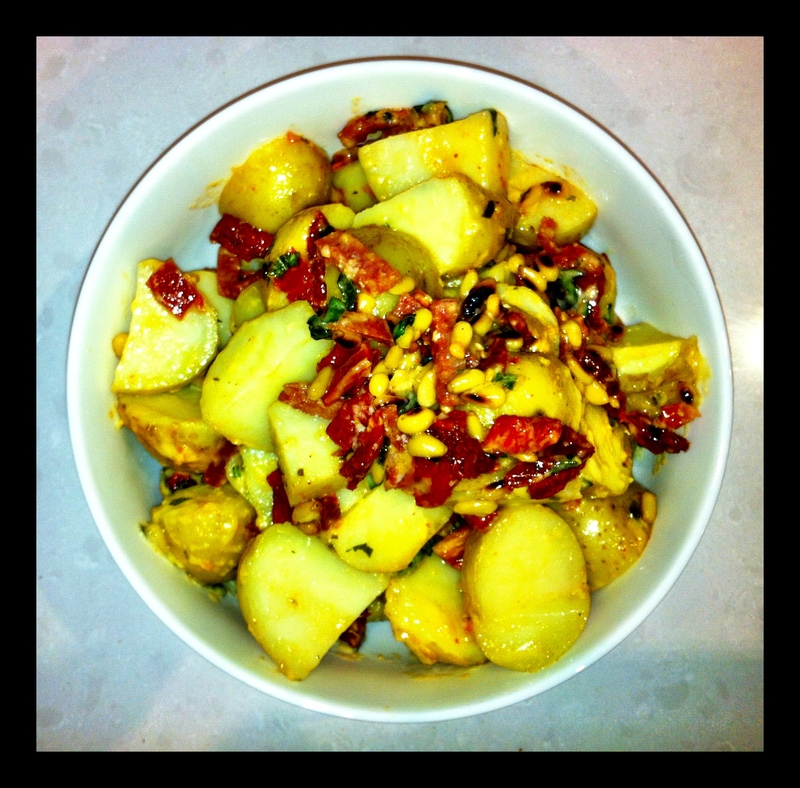 The portions in this recipe are for a winter side dish. Mix all ingredients together. Add salad dressing just before serving. 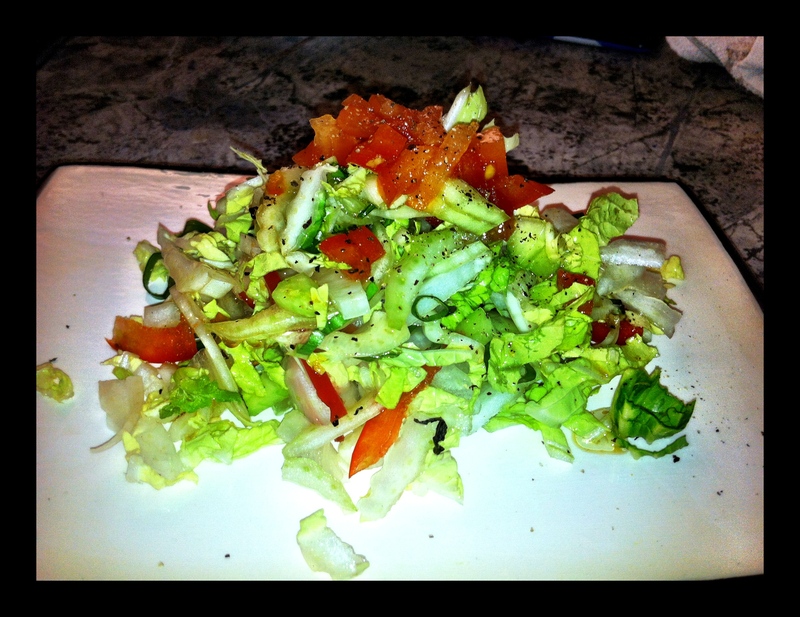 Use just enough dressing to lightly coat the salad. When the weather cools down, and especially at night, salads tend to lose their appeal in favour of more hearty warm dishes. The thought of crisp light cold lettuce just doesn’t grab you like it did on a hot summer night in January (or June depending on which hemisphere you are living in!). 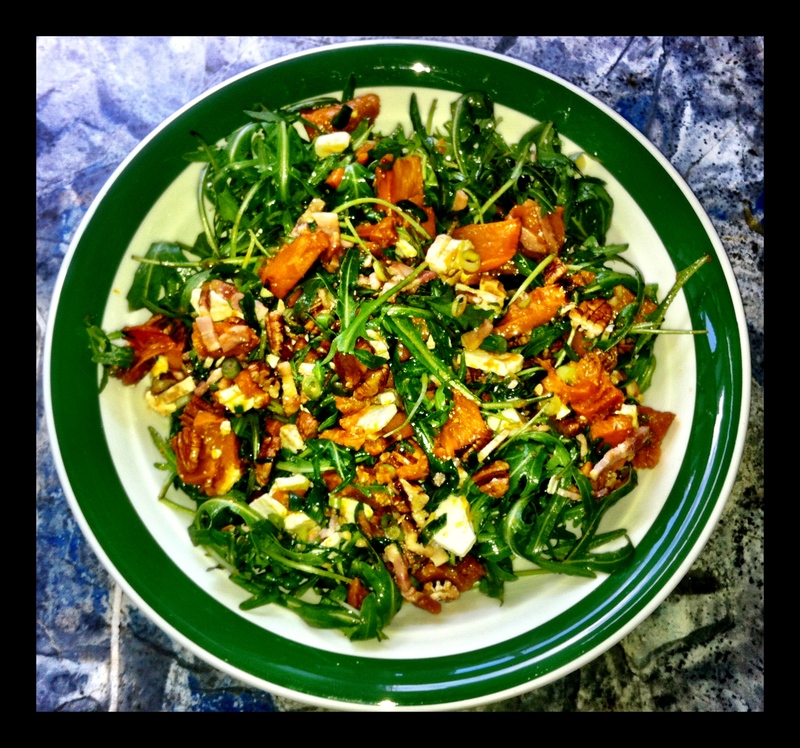 This salad is a great blend of light and crisp, with warm and hearty mixed in. This recipe serves 4. Divide lettuce amongst the plates to create a bed. 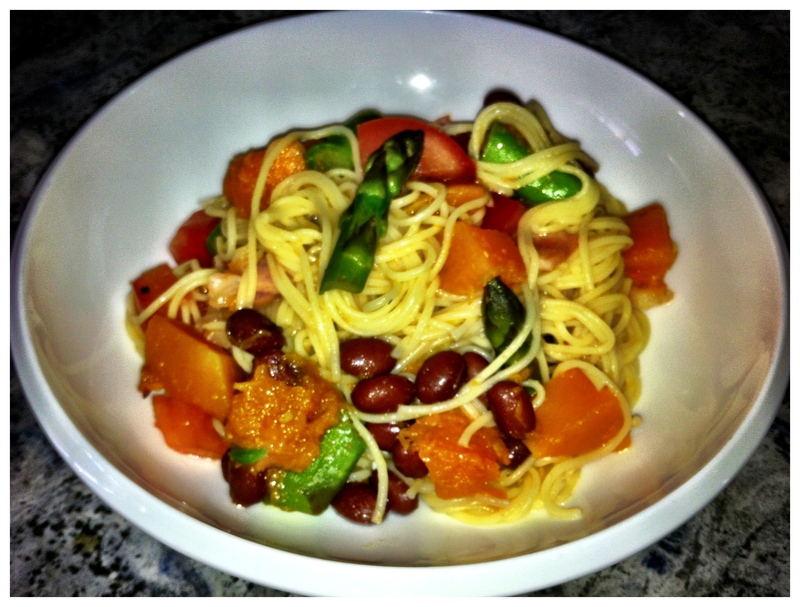 Combine rice, capsicum, carrot, snow peas, mayonnaise, balsamic, parsley (reserving some for garnish) and basil in a bowl. Divide rice mixture over the lettuce beds. Place chicken slices over the rice. Sprinkle pecans and pumpkin seeds over, and top with remaining parsley. I poach about a 3/4 to 1 kg of chicken breasts as a time, so I can use for multiple meals. Place stock mixture over high heat. Add chicken once it is close to a boil, turn heat down to simmer. Cook until just cooked. Chicken breasts are easily overcooked. Leave in liquid until ready to use. Can be poached a day ahead. If doing so, slice chicken and then very gently reheat in a bit of the stock. Strain before adding to salad. I do about 3 capsicums at a time. Thinly coat roasting tray with olive oil. Slice 3 cloves of garlic and spread over tray. De-seed capsicum and cut each one lengthways into about 10-12 lengths. Roast on high heat until soft. If desired, remove skin once cool.